Stilettos & Grace: "Angela Needs"
My dear friend did this and had fun results, so I had to do it, too. 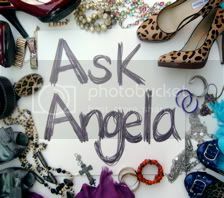 I typed in "Angela needs" on google. The results were so hilariously true I nearly fell off my chair laughing. Not only were they right on, I think they were of a divine nature. The first result was, literally, "Angela needs a vacation." After a few of those matches, the next result was "Angela needs prayers." Ha! Happy New Year! Nate's at work and I have to be up early, so I'll be ringing it in asleep. Maybe next year we'll join you partying people. This was pretty fun to do... we will definitely pray for you and the rest of the Whites. and I found a link to this post on your blog! That is too awesome, I'll have to put up my own too. Except that it'll look just like yours! Your blog is now the top result for "Angela needs"
Oh man, am I having fun with this! I just did the same with my name and my hubby's name...evidently I need "saving", "more rum", "a home to call my own", and "a better agent". Hubby needs (among other things) "to drink more beer" and "viagra"!!!!!!!!!! Good grief. This is SO going to be tomorrow's post for me! :) Thanks for the laugh!